Your NOOK Tablet comes ready to work with some Facebook or Twitter features and you can import your contacts from a Google Gmail account. All of this, of course, requires that your NOOK Tablet be connected to a WiFi network and signed in. On Facebook you can post recommendations, comments, quotations, and LendMe offers on your own wall or on a friend’s who’s given you that access. In Facebook lingo, you can “like” a book to declare your feelings. You can even tell the world of your “reading status” if you think it’s important to declare that you’ve reached page 125. Then there are the tweets that tumble to your tablet from Twitter. If you let your NOOK use your account, you can read Tweets, see the online names of the people you follow, follow someone new, and update your profile. The Twitter exceptions: You can’t get to your direct messages or set your Twitter password from the special app on the NOOK Tablet. However, you can go to the NOOK Tablet’s web browser and sign into Twitter if you want to do those tasks. The world of Google is burgeoning. 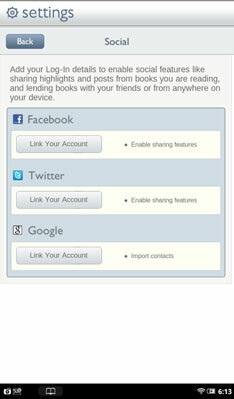 When you link your account to the NOOK Tablet, you can move amongst most of the Google apps, including Gmail. In the Settings panel, scroll down to App Settings and tap Social. Link your Facebook, Twitter, or Google accounts. Each website has a different login screen, and their features will change over time. If you don’t have an account with Facebook, Google, or Twitter, you can sign up through the page displayed on your NOOK Tablet. You may find, though, that it’s easier to sign up, customize, and enhance your page from a personal computer. Wherever you connect to one of these services, all of your actions are linked.